With proper care, goldfish can live up to 30 years. They reach adulthood at around 2 years of age. Caring for adults is different than caring for fry or juvenile goldfish. Goldfish fry and juveniles should be kept in environments separate from the main tank until they are fully grown so the adults don’t eat them. It’s a myth that goldfish grow to the size of their tank or bowl. In fact, it’s cruel to keep goldfish in a bowl. Goldfish thrive only when they have enough space to move around freely. Goldfish get their oxygen from the water’s surface, so your tank must have sufficient surface area that all goldfish can do this comfortably without being forced to mingle if they don’t want to. For each fish, your tank should have 30 square inches of surface area. A bare tank is a boring place to live. Goldfish need to be able to hide and explore. Gravel gives the tank a natural bottom. 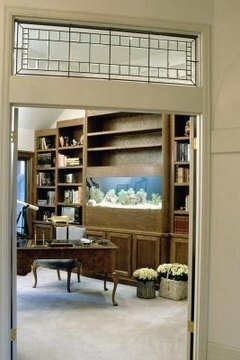 Consider extra tank decorations too, so your fish can swim through and between things to emulates the environment they would live in if they were wild. Make sure the tank is positioned away from sources of cold and warmth. You need to be able to carefully control the water temperature. This is much harder when you have external factors such as sunlight or cold from windows in the equation. The tank should always be between 65 and 68 degrees Fahrenheit, and you should change at least 15 percent of the water each week. Before you put your goldfish in their tank, the tank must "cycle." Goldfish produce a lot of ammonia, which is not a nice substance to swim around in. Goldfish gravel harbors bacteria that neutralize the ammonia, but only do this when they form a colony. You can help them form a colony quicker by turning up the temperature of the water, purchasing bacteria in a bottle or getting a bottle of water from the tank of a friend with an established colony. Only afterward, and after testing, will you add the fish. Goldfish are omnivores who will eat anything. But the best food to give is basic pet-shop goldfish food, as it delivers the optimum balance of nutrients. You can tell when your fish are receiving the optimum diet, because their color becomes rich and glorious. A dull or patchy goldfish is not a healthy goldfish. A single goldfish living on his own for up to 30 years won’t have a particularly interesting or fulfilling life. The best way to provide company is with other goldfish. Goldfish have specific environment requirements, which means a goldfish tank is not the ideal place for the majority of other fish. There’s also the problem that goldfish often try to eat other fish, even their own kind. So when you introduce new fish to the tank, make sure you do so when both fish are of an equal size. RPSCA Australia: How Should I Keep and Care for Gold Fish?